Why can't I make an 8x10 print from the picture I took? I enlarged my original image file to 8"x10", and now it looks funny. What's wrong with my camera? Well, there's nothing wrong with the camera or the computer editing program. It's all about proportions. In these cases, physics dictates that some things just can't be done. The picture above illustrates the full format of most DSLR cameras. As the picture is taken, it is ideally proportioned to produce a 4"x6" print that contains the ENTIRE image. In ratio terms, that's a 2 to 3 relationship between the height and width of the print. Any print that violates this 2:3 relationship will be a distortion of the original image. That's worth repeating. Any full-frame print you make from the camera's original digital file whose sides are not in the ratio of 2 to 3 will not be a true representation of the image you saw through the viewfinder. 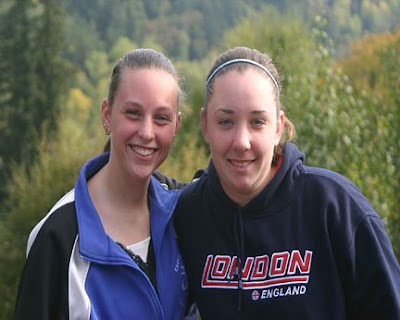 Here's an example of an enlargement that is proportional to the original image file. Increasing the size of a print from 4"x6" to 8"x12" is proportional and will not be distorted. The clue is: If you increase both dimensions by the same multiplication factor (in this case 2), the resulting picture will be in proportion to the original. So, does that mean I can't make an 8"x10" print and keep everything I saw through my viewfinder in the final print without distortion? Here is an 8x10 print size (black lines) with the width of the original image set at 10 inches in Photoshop. The picture above is the same image file enlarged to produce a print that is 10 inches wide. Notice that this sizing produces a picture with a large white border at the top and bottom of the print. But the picture is proportionally correct and will NOT be distorted. To produce a print that captures all the elements of the orginal file this picture must be scaled in only one direction. As a result, the picture will always appear distorted. The vertical lines are elongated and distorted to create this full 8x10 print from the full frame of a DSLR camera. The picture above has been "scaled" (stretched) to fill the entire 8"x10" piece of paper. Simply put, the DSLR full image frame can only be enlarged in a 2:3 ratio and contain the entire original image. Said in another way, both the height and width must be multiplied by the same number to remain exactly proportional. Can that be true? I see professional photographers selling 8x10 prints all the time. You're right. But the professional photographer understands this "fact of nature" and crops for the 8"x10" print while he/she is taking the picture. 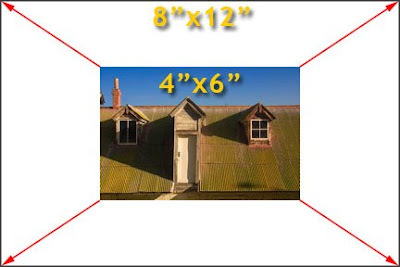 Photographers understand the area of an image that will be included in an 8x0 print (the red box) when they are taking the picture. 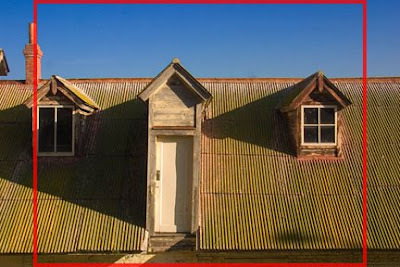 The red box superimposed on the picture above is burned into the mind of long-time photographers. They understand that the original picture must be taken with the final print size in mind. 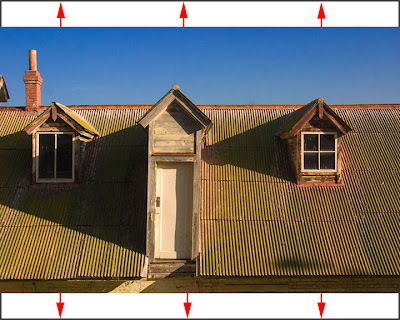 In this case, if the end result is to be an 8"x10", the photographer will keep his entire printable image within the boundaries of the red box. That portion of the image will enlarge to a perfect 8"x10" and the remaining image at each end will be discarded. By the way, the 8x10 proportion is also applicable to other standard photographic print sizes -- 4"x5", 16"x20" and 20"x24". Some professional cameras will have this (and other) proportion indicators physically etched into the viewfinder's ground glass to provide an exact visual reference for the photographer. From a practical and beginner's standpoint, when in doubt leave a little extra room around your image as you take the picture to allow you to eventually make a print that contains all the elements you intended in the picture. This picture is shown in the native 2:3 proportion of the original DSLR image. The same image when forced to fit into the 4:5 ratio of an 8"x10" print via Photoshop's "Scale" function. Obviously the contorted effect caused by the disproportionate scaling is objectionable and not a true rendering of the subjects. At the same time, notice that every picture element in the original 2:3 ratio photo is contained in this version as well. But each element has been elongated to fit the format while grossly distorting the image. Finally, there is one more alternative. The actual dimensions of the picture area of the third picture in this post are approximately 10 inches by 6.7 inches. Remember this picture is proportional to the original image file. There is nothing wrong with a 10"x6.7" picture. It just won't fit in a normal frame (like 8"x10") or pre-cut matt. But that's not necessarily bad. You can cut a 10"x6.7" matt or have a framing store cut one for you. For example, a framing company could cut a matt with the outside dimensions of 11"x14" and a cut out measuring 10"x6.7". The resulting matted print would then fit inside a standard 11"x14" frame.